No matter what membrane is protecting your roof, it’s best to walk the roof at least once a year — twice is even better. During that inspection, clear any debris from the roof and pay close attention to drains to ensure that they are clear and functioning correctly. 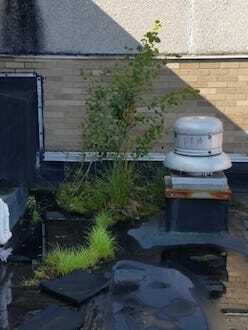 Even on roofs with no trees overhanging them, dirt and debris can collect, and nature often finds a way to have drain-choking roots take hold. Although these are simple inspections, note that many insurance companies require them to be done by a licensed and insured contractor, so check with your insurer before any DIY efforts. Another incentive for maintenance is to protect your warranty. It varies by manufacturer, but many warranties are voided if you do not perform basic maintenance — check with your manufacturer to ensure you’re covered and determine what maintenance is required. Any significant rainfall can briefly produce some standing water on a roof, but ponding is generally defined as water that has not evaporated 48 hours or more after a rainfall. While ponding water does not affect the performance of FiberTite® membranes, it can still pose a serious threat. It can lead to increased leaks and damage with other membranes or even collapse the roofing deck or the entire roof. Take ponding seriously when you see it. We have more on ponding water here. Regular inspections will help find and fix problems early. Many fixes take very little time or effort while other ponding is caused by significant issues that will require a professional roofer to solve. Obstructed drainage: All too often I encounter roofs pushed past their limits through simple neglect. Plants and dirt build up on the roof and in drains, and soon your roof looks like a duck sanctuary. Compressed insulation or membranes: A compressed membrane can have many causes or a combination of them, including age, heavy foot traffic, prior periods of ponding, heavy objects like HVAC units or other issues. A major cause is wet insulation, which we explain here. Structural issues: Some roofs have design issues, inadequate or poorly located drains, sagging with age, etc. All of these things lead to damaging ponding. As with many problems, preventing ponding in the first place is the best way to start. 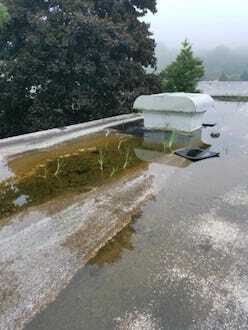 Regularly inspect your roof not only for areas of ponding but also around drains. Clear away dirt, debris and other obstructions to ensure maximum draining efficiency. As you can see in the picture, sometimes it’s as simple as clearing a drain of organic material! While FiberTite will not leak or be directly damaged by ponding water, any ponding water is a serious issue for a low slope roof. Address roof pond water as soon as you notice it. If you have any questions about ponding or any other low slope roof issues, contact FiberTite.